With nary a whimper, capitalism has been permitted to morph into rentierism and is suffering consequences warned by Adam Smith and Henry George. Taxes on wages in Australia were fairly minimal until WWII, since which time they’ve been ratcheted up significantly. Federal taxes before the war consisted mainly of customs and excise charges and the federal land tax, introduced in 1910. The States and municipalities also levied land-based taxes. These played an important part in the development of Australia, especially in regional areas. This chart from American Government Finance in the Long Run 1790 – 1990 shows property taxes were also the main source of revenue in the United States until the 1940s. Land Values Research Group studies since 1943 showed the positive role played by property taxes in developing Australia. Particularly interesting is the case of Victoria which until 1920 had rated on the basis of net annual value rating (NAV) at municipal level. After that time, municipalities were given the right to choose to ‘rate’ on unimproved land value – now site value rating (SV). Many municipalities made the change to SV rating, and there was not one instance where the economic performance of the city did not improve immediately after the change to SV in comparison with cities that had remained on the NAV system. This statement held true even during times of economic recession. 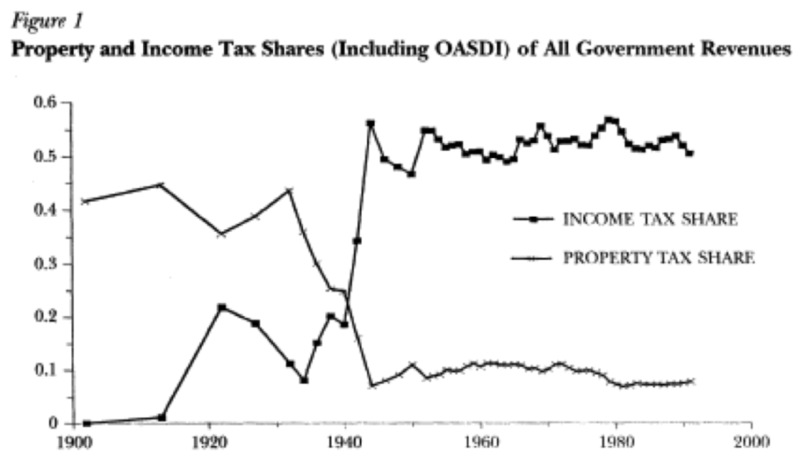 However, as the US chart shows, it became fashionable following WWII to wind back the importance of property taxes. There is little doubt that the property lobby led this putsch, often using “the poor widow” as the stooge to promote their cause. California’s Proposition 13, which reduced property taxes by almost 60% from 1978, represented the full flowering of the retrogression. That the once ‘Golden State’ has since lost its economic preeminence is not coincidental. Where several other states followed the economic decline by enacting similar legislation, it’s instructive to note the superior economic performance of those US states which retained higher property taxes. Following the popular trend, Australia has lowballed property taxes from the early 1970s, when the Whitlam Government decided to ‘assist’ municipal funding federally. Meanwhile, the UK rating system had been permitted to fall into disrepair. It was eventually dismantled. So, the green light had been given to larger and larger speculative land booms and busts from which it has become increasingly difficult for nations to extract themselves. The remedy is obvious, but banks, the 0.1% (including Donald Trump?) and their acolytes remain opposed. They’d rather people suffer than address the issue. To paraphrase someone or other: Increasing poverty must create great universities, because it could not possibly be the other way around. This article was originally published on Bryan's blog at thedepression.org.au on December 3, 2017.